Bumps are firm with a core of white material. They are caused by a poxvirus. This is a different virus than the one that causes warts. Friction or picking at them causes them to increase in number. Some doctors advise not treating them if there are only a few. Reason: They are harmless and painless. They have a natural tendency to heal and go away on their own. Avoid baths or hot tubs with other children. Reason: Can spread in warm water. Contact sports: Can spread to other team members. They should be covered or treated. Time it takes to get them: 4 to 8 weeks after close contact. They are harmless and painless. Wart-removing acids are not helpful. Duct tape treatment will make them go away faster. Covering them with duct tape can irritate them. This turns on the body's immune system. The covered ones become red and start to die. When this happens, often all of them will go away. Try to keep them covered all the time. Some children don't like the tape on at school. At the very least, tape it every night. Discourage your child from picking at them. Picking it and scratching a new area with the same finger can spread them. A new one can form in 1 to 2 months. Chewing or sucking on them can lead to similar bumps on the face. If your child is doing this, cover them. You can use a bandage (such as Band-Aid). Without treatment, they go away in 6 to 18 months. If covered with duct tape, they may go away in 2 or 3 months. If picked at often, they can become infected with bacteria. If this happens, they change into crusty sores (impetigo). Your child doesn't have to miss any child care or school. There is a mild risk of spread to others. This shows an infection from the molluscum contagiosum virus. Molluscum is sometimes called a "water wart." The growths are pink, white or pearly-colored. They are firm, small and raised with a dimple in the middle. 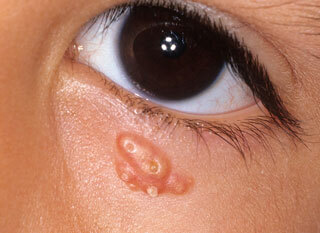 This shows an eye with an infection from the molluscum contagiosum virus. The growths are pink, white or pearly-colored. They are firm, small and raised with a dimple in the middle.